Do your eyes sting or feel scratchy? Do you look in the mirror and see red eyes staring back at you? Or perhaps you always need to rub your eyes because they feel dry and irritated? 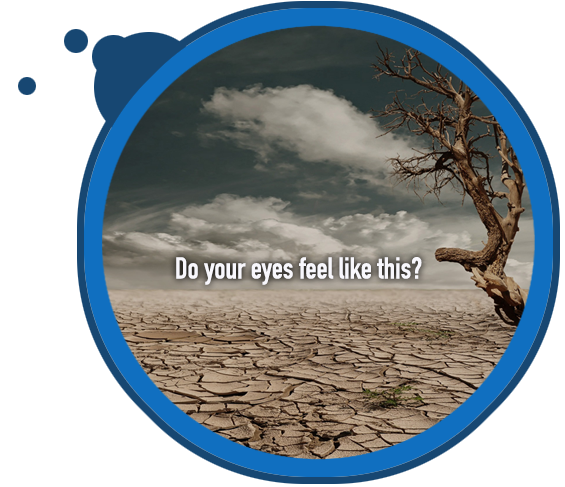 These symptoms may point to Dry Eye Syndrome – a very common, annoying condition. Fortunately, our expert eye doctors in Squamish and West Vancouver are knowledgeable and experienced with treating dry eye. Contact us to schedule an eye exam to determine the best dry eye treatment for you. There’s no reason to suffer – we can help restore your comfortable vision! A wide variety of culprits can lead to dry eyes. In general, either your tear glands do not produce enough tears or your tears have a poor quality chemical composition, which causes them to evaporate too rapidly. There is no absolute cure for dry eye, yet our eye doctor can design a dry eye treatment plan to relieve your painful symptoms. First, we must determine the cause of your personal dry eye condition. Many symptoms are shared by all patients with dry eye, yet the underlying causes vary widely. We will perform a comprehensive eye exam to uncover the root of your dry and red eyes and to rule out any other ocular complications. We may use a specialized procedure (quick and painless!) to measure your tear quantity and tear osmolarity. Our optometrist may also perform a Schirmer test, in which a thin piece of filter paper is placed along your lower eyelid. In addition, we will ask you about your overall health, lifestyle, and living environment. Your responses will help us to recommend a personalized treatment. Dry eyes can interfere with many daily activities, making it difficult to read, drive or play sports. Our Optomeyes eye doctors, in Squamish and West Vancouver, BC, can improve your quality of life with effective dry eye treatment! Come see us at Optomeyes Eye Care for all your dry eye needs, today!